Today – in a time of national conversation about immigrant journeys – Grace Awh shares a remarkable work of history, Daughters of the Samurai: A Journey from East to West and Back, by Janice Nimura, then reflects on her own family’s journey from East to West. From Grace: Not many Nashvillians know that the Consulate-General of Japan is located right on West End Avenue. It’s the Japanese diplomatic office for U.S.-Japan affairs for five Southeastern states. Yoshie Kinefuchi, a brilliant member of our book club and the wife of the Consul-General, generously hosted us for our discussion of Daughters of the Samurai, by Janice P. Nimura. Nimura, a resident of New York City, was visiting Nashville as a guest of the Japan-USA Society during the recent Samurai: The Way of the Warrior exhibit at the Frist Center for the Visual Arts. We had the pleasure of having Nimura lead our discussion that evening. Nimura met her future husband while both were students at Yale University. She then moved to Tokyo and lived with her husband’s family for three years before returning the U.S. to earn her master’s degree in East Asian History at Columbia University. Her experience as an American in Japan, coupled with her formal academic roots and a gift for storytelling, allow her to illuminate a little-known historical gem. In Daughters of the Samurai, Nimura recounts the true story of three young Japanese girls sent by the Emperor to America in 1871, during the rise of the Meiji period. Fewer than two decades had passed since Commodore Perry’s heavily armored “black ships” shattered Japan’s 250-year-long isolation, exposing the secluded nation to the West. The Emperor Meiji responded by embarking on a path of modernization, sending hundreds of ambassadors around the world to seek knowledge of Western progress and to return to strengthen Japan. 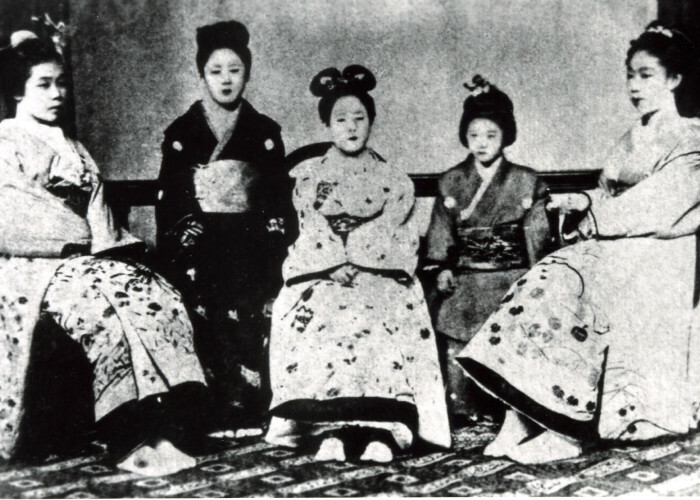 Included in a delegation of a hundred statesmen and scholars were five young girls (two were to return almost immediately to Japan), all daughters of samurai families. The girls on the occasion of their audience with the empress. Left to right: Tei Ueda, Shige Nagai, Sutematsu Yamakawa, Ume Tsuda, Ryo Yoshimasu. In the late nineteenth century, most Americans had never met an Asian. The arrival of these young girls in their silk kimonos caused astonished headlines across the country to explode with news of the fascinating “daughters of the samurai.” They were separated to live with progressive scholars in different cities. Imagine the isolation these girls felt! The girls excelled at their studies and the two oldest girls, Sutematsu Yamakawa and Shige Nagai, were eventually accepted at Vassar College. This was at a time when it was not common for an American woman to pursue higher education. In 1882, they became the first nonwhite students at Vassar. Mrs. Elida Vineyard DeLong, Charles DeLong’s wife, served as chaperone to the girls on their journey to America. 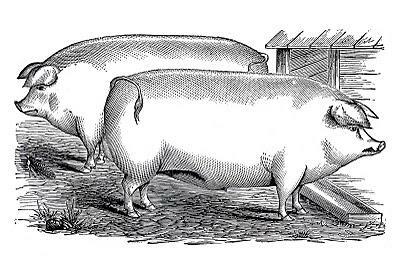 Harper’s Weekly ran an image of her with her charges. 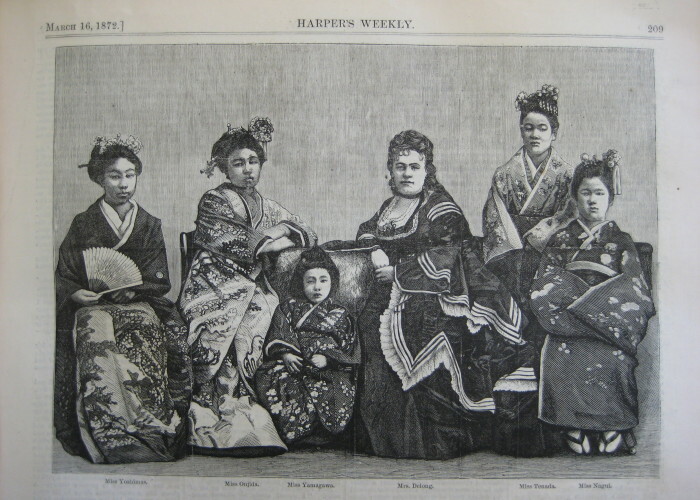 At Vassar, Sutematsu and Shige found a rich social life and made lifelong friends; one of them, Martha Sharpe, is pictured with them here. After a decade in America, the women return to Japan to fulfill their mission. But adjusting to traditional Japanese culture proved difficult. Japan now seemed foreign to them – they saw themselves as Americans. Shige had the easiest transition – she married a Japanese naval officer who was an exchange student at Annapolis Naval Academy. She became a rare “working mother” teaching music while raising six children. Sutematsu married the Japanese Minister of War, entering a world of stifling formality and protocol, but becoming an influential figure in his powerful circle. As her husband’s rank grew more and more exalted, Sutematsu used her status to promote charity work, especially in support of Japan’s efforts in the Sino-Japanese and Russo-Japanese wars; her prominent position also made her the target of gossips. Ume Tsuda, the youngest of the three, would leave the most lasting legacy. She returned to the U.S. to attend Bryn Mawr College in 1889, and later founded a small school for women to study English in Japan. Today, that school, Tsuda College, is one of the most prestigious women’s colleges in Japan. With the support of Sutematsu, Shige, and Alice Bacon, Ume opened her Women’s Home School of English, here pictured in its new home, 1901. Ume sits squarely in the center. Nimura’s historical account of these brave pioneers is beautifully written. She draws her narrative upon in-depth archival research and decades of letters, all written in English, between the women and their host families. Nimura recognized parallels with her own experiences as an American in Japan as she struggled to find a place for herself in a community where the chasm in cultural differences was deep and wide. Reading this book caused me to reflect on my mother’s and my mother-in-law’s bravery as they journeyed from South Korea to the U.S. in the early 1950’s. They, too, would not return to their home country for more than a decade. My mother, Choonhi Choi, a biochemist, came to the U.S. on a United Nations fellowship to the Sidney Farber Cancer Center (now Dana-Farber Cancer Institute). Sadly, my mother succumbed over three decades ago to the very disease she studied. My mother-in-law, Pongsoon Awh, dreamed of an opportunity to study in the U.S. She recalls, “To go to the United States was like going to the moon.” Only a few students were allowed to leave Korea as graduate students. She recalls sitting for a selection exam. “It was very difficult – we wrote many essays and were even tested on our knowledge of European History! The examination room was filled with many men and only two women. Only two passed, and I was one of them.” She eventually earned her master’s degree in English literature at the University of Florida and was working on her PhD when her first child, now my husband, was born. Like the young women in Daughters of the Samurai, my mother-in-law feels more comfortable in her American identity. She is currently reading Dostoyevsky’s The Brothers Karamazov, plays a mean game of bridge, and rarely misses a Titans game on a Sunday afternoon. And when she visits Korea, storekeepers will call out to her in English simply because of the way she carries herself – like an American. “Grace is so absolutely incredible that it is nearly impossible to describe her with brevity,” says her friend and partner in crime, Laura Tidwell Smith (they co-chaired the Authors in the Round dinner, a fundraiser for the Southern Festival of Books, a few years back). “She is a brilliant lawyer, a devoted mother, a passionate community volunteer, and a thoughtful leader. She is well-read and well-traveled. She has a kind heart and a generous spirit. She charms everyone, and she makes her friends feel exceptionally special.” I couldn’t have said it better myself! Grace was born in Boston, grew up in New York, attended Wellesley College, and received her law degree from George Washington University. She and husband Dr. Carl Awh, a retina surgeon, moved to Nashville in 1994. Their three children have all launched successfully into college and beyond. Grace has participated enthusiastically in Nashville’s community life, including – but not limited to! – service on the Boards of The Women’s Fund of the Community Foundation of Middle Tennessee (past President), the YWCA (co-chairing the Academy for Women of Achievement), the West End Home Foundation, Cheekwood, the Nashville Public Library, and University School of Nashville. She co-chaired the Authors in the Round dinner and the Power of the Purse luncheon and served as Montgomery Bell Academy’s Mothers Club President. Is it any surprise that Grace was selected to participate in the Leadership Nashville class of 2015? She brings a steady and radiant energy to all her endeavors. Extraordinary photos and captions of Samurai girls from Photo gallery at Janice Nimura’s website. What a lovely post, Grace! I loved reading your book review but found your own background even more interesting! Americans are known for their entrepreneurial spirit, but I think that so much of that is the gift of immigrants who come to our country and have the courage to take risks and try new things because they’ve already drawn strength from their ability to adapt to a new culture. Thank you so much for sharing about your pioneering mother and mother-in-law! us in our area and fly mostly “under the radar’. Fascinating and captivating post on several levels. Thank you for sharing the history and heritage! So memorable. Thank you, Grace, for this book recommendation, for sharing a bit of your story and for giving so much back to our city! Thank you, Grace, for this lovely souvenir of my visit to Nashville–and for sharing your inspiring family stories. I couldn’t ask for a better reader! 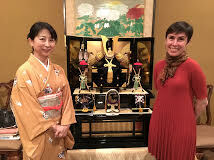 And thanks also to Yoshie Kinefuchi and Leigh Wieland for being extraordinary hosts. It was so special to meet you, Janice! Grace, I loved learning more about your own family in this book review of those extraordinary Japanese young girls. I’ve always marveled at people like your own mother and mother-in-law who are willing to set aside the comfort of their own culture to take on a foreign challenge. I love to travel, but I’m in awe of the sacrifice necessary to make a new homeland one’s own. Grace – miss you and loved reading your book review and inspirational stories about your mother and mother-in-law! Grace, your thoughtful words remind me what I love so much about reading – the way one story shines a light on so many others. The parallel between Daughters of the Samurai and your own family’s history is powerful, and I understand it better from having read this wonderful book. Thank you for sharing. Grace, What a wonderful post! It is great to learn about you and your family’s accomplishments and experiences! Looking forward to another season of golf!